New York Empire kickstarted their overall ranking comeback with a phenomenal double clear in Monaco from Scott Brash and David Will, watched on by teammate and team owner Georgina Bloomberg. In an edge of the seat first round of the GCL competition, Brash and Will pulled out all the stops to deliver a Formula 1 fast clear, finishing ahead of four other teams who were able to keep a zero score today, giving themselves the best opportunity as the teams look to the GC Prague Playoffs this December. With only the top 16 teams qualifying for the GC Prague Playoffs, New York Empire are currently in 16th and dangerously close to the drop zone. A strong result for the team this weekend would put them back in the running for the second half of the season, boosting their chances of reaching the Playoffs as the remaining events unfold. As the sun set over Monaco’s Port Hercule, the floodlights came on as VIPs and spectators flocked to the unique set up, where the top athletes in show jumping took centre stage next to super yachts, moored just metres from the red carpet. 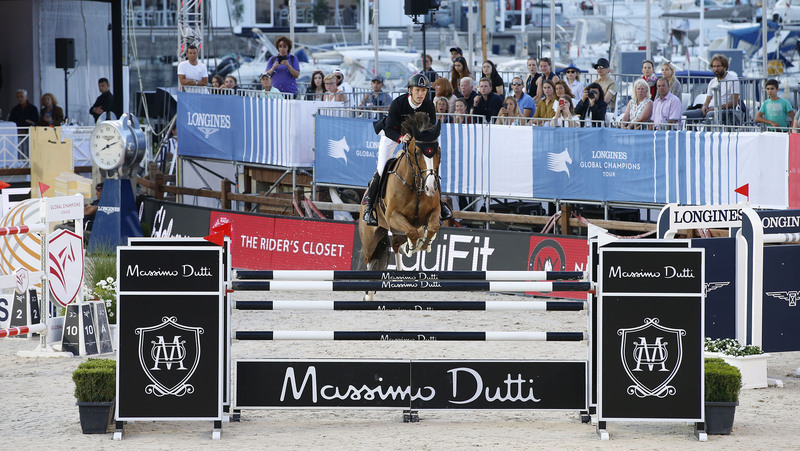 The compact arena offered up a flowing but technical course set by Frank Rothenberger, who placed combinations up the long side as well as featuring a gappy Sapinda vertical, huge 1.55m Massimo Dutti oxer, with a light Air France vertical to finish. First to go Alberto Zorzi of Valkenswaard United had the unenviable task of finding the perfect path around the twisting course. Opting for a steady clear, the Italian rider piloting top mare Fair Light van T Heike to perfection, containing her bouncy canter and leaving all the poles up. Teammate Bertram Allen knew he had to secure another clear with Izzy by Picobello to be in with a chance of shaking rivals London Knights, but one pole down put the team on four faults, with the rest of the field yet to come. A brilliant double clear came quickly from Prague Lions, after Gerco Schroder with Glock's London and Anna Kellnerova with Silverstone G pulled out faultless rounds to shoot them up to the top of the leaderboard, but it would be a day of double clears as they were soon joined by Montreal Diamonds’ Harrie Smolders with Cas and Mark McAuley with Miebello and Scandinavian Vikings’ Geir Gulliksen with VDL Groep Quatro and Leopold van Asten with VDL Groep Miss Untouchable. New York Empire, who are currently 16th in the overall rankings started their comeback mission with vengeance after Scott Brash with Hello Forever and David Will with Deluxe Ilton pulled off two brilliant clear rounds. Bolstered by Hello Forever’s return to CSI5* competition following a short break, the race is on for the red, white and black team to gain every valuable point possible in the remainder of the season. Constant van Paesschen pulled off an impressive clear for the Rome Gladiators with the energetic stallion Jilbert van 'T Ruytershof leaping and bounding his way around the arena. Tactics clearly came into play, with a steady clear to start, before he was swiftly backed up by Marlon Zanotelli and Rock'n Roll Semilly who kept the team on a zero score and with a speedy time to shoot them up to the sharp end of the grid. There was disappointment for Cascais Charms, who fielded the heavyweight duo of Rolf-Goran Bengtsson and John Whitaker. But both poles down at the tropical double for Whitaker with Cassinis Chaplin put them down the order, despite Goran-Bengtsson’s clear with Oak Grove's Carlyle. Overall ranking leaders London Knights had an upset after Martin Fuchs and Chaplin clipped the oxer, picking up four faults for the team before anchor Ben Maher and Winning Good jumped clear, putting them back on a level playing field with closest rivals Valkenswaard United. Final team to go, Monaco Aces, initially had all the luck on their side after their draw of last in the order. First in the arena Simon Delestre pulled out all the stops with Filou Carlo Zimequest, the pair delivering under pressure to keep their score clean. But it wasn’t to be after Julien Epaillard with Safari D Auge rolled two poles, dropping the team down the order and out of prime position heading into Saturday’s showdown. So it would be the New York Empire who start their campaign to rise back up the order, taking pole position as last to go in the GCL Monaco final. However, with five teams all on a zero score, the action will be right down to the wire to see who will claim this win in the spectacular Monte-Carlo arena.